Closing arguments wrapped up Friday morning and the jury was expected to begin deliberating in the afternoon in the first trial of protesters arrested on Inauguration Day. They face charges of rioting and destruction of property. But defense attorneys argued that there is no evidence to convict the six protesters and that prosecutors were trying to convict them based on the color of their clothes. Sara Kropf, defense attorney for Britne Lawson, gave the second-to last closing argument for the six defendants, who were arrested on Jan. 20. Kropf said Lawson was at the protest as a street medic. The jury deliberated for a short period Friday afternoon before being dismissed for the weekend. Deliberations will resume Monday. Lawson and the other defendants have argued that prosecutors are overreaching by charging each with the felonies of engaging in a riot, conspiracy to riot, and property damage. Prosecutors Jennifer Kerkhoff and Rizwan Quereshi have acknowledged that the six people on trial did not personally break windows nor cause more than $100,000 in property damage. 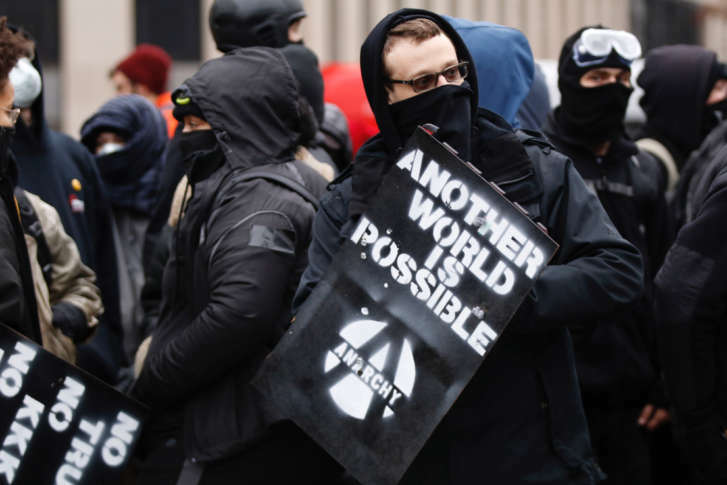 However, prosecutors told jurors that by wearing black, covering their faces and cheering on destruction of property and injuries to law enforcement officers, the six defendants were guilty of rioting. Kropf and several other attorneys have said the prosecution is an attack on the First Amendment rights to free speech and association. “No matter your politics, the First Amendment is a right we all enjoy,” said defense attorney Jaime Heine, representing Michelle Macchio. “There’s no evidence Ms. Macchio rioted. Wearing the color black is not enough. Being anti-fascist is not enough. Being anti-Trump is not enough,” Heine said. “Today happens to be the 226th anniversary of the ratification of the First Amendment,” Kropf said. Prosecutors objected to the suggestion that a guilty verdict could end future protests. After a meeting at the bench, D.C. Superior Court Judge Lynn Leibovitz reminded jurors they should limit their considerations to the charges facing the six defendants on trial. More than 200 protesters were arrested on Jan. 20. About 20 have pleaded guilty, and prosecutors have dropped charges in almost two dozen cases. The remaining protesters will be put on trial in groups of five or six, over the next year.